The 380 auto inhabits a valuable and useful place in our society, mostly because of the easily concealable, tiny pistols chambered for it. However, because of the very limited size of the cartridge, it is plagued with limited power and therefore most of the existing ammo in 380 auto suffers from not being reliable as a man-stopper. We've studied and played with nearly all of the existing available 380 ammo and find it wanting as a reliable means of self-defense, especially against a large, insane, drugged up/ pain-free, determined attacker. The current 380 auto frangible ammo delivers a large amount of surface trauma but lacks serious penetration. For example, if you shot me or another sane man in the face with modern frangible 380 ammo, it would blow off a big portion of my cheek and send a few teeth down my throat, I would undoubtedly fall to the ground in shock and pain, but I would be very much alive and functional if I could get past the shock and pain as that frangible bullet would have stopped somewhere inside my face, never making it to my brain. However, if you shot a drugged up maniac in the face with that same frangible 380 ammo and blew half his cheek off, he would keep right on coming because he is insane and is not thinking like you or I. Plus, he is likely pain free and fear free and won't know that half his cheek is missing and if he did know, he would not care. So whatever 380 ammo you shoot him in the face with, had better go through his face and blow his brain stem out the back of his head, because only a CNS (central nervous system) hit with a 380 is going to stop him. Likewise, a torso hit to the sternum needs to penetrate deep enough to blow all the way through his spine to shut him down spontaneously. If you fail to shut him down instantly, you and your loved ones are going to have to find a way to survive while you wait for him to bleed out and pass out. The best chance of survival for you and your family is to shut down the attacker instantly. So, we've designed a few 380 auto +P loads to keep you and your loved ones alive under the worst of scenarios. 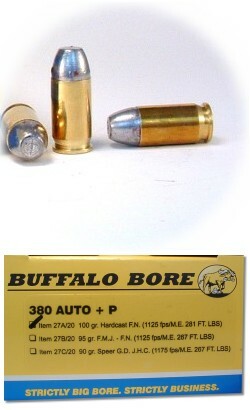 This 380 Auto+P ammo will better all American made 380 Auto ammo by 150 fps to 200 fps in all bullet weights we make. This is a serious improvement in this typically anemic cartridge. This 380 auto+P ammo is more powerful than the typical 38SPL ammo made by most American ammo makers and you'll get seven shots of it in a small/flat/lightweight 380 versus five shots out of a bulkier 38 SPL J frame revolver. Additionally, with the 380 you'll get much faster reloads and the little magazines are flatter than a speed-loader used for a J frame. Item 27A/20 is a 100gr. HARD cast bullet with a flat nose. It is traveling over 1,150 fps out of my 3.75 inch BDA (Browning Double Action). We've used a flash suppressed powder for all three of our 380 auto loads so that you won't be blinded by your own gunfire if you have to shoot in the dark and since around 95% of all civilian shootings in America occur in low light, the chances that your gunfire will blind you while you are trying to save your life are good - we've eliminated this variable by using flash suppressed powder. We've also chosen a flat nosed solid bullet. The flat on the nose ensures that the bullet will cut/smash its way through flesh and bone and do much more destruction than typical round nose FMJ bullets. 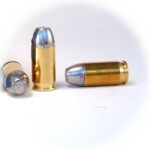 Round nosed bullets tend to slip and slide through matter, doing little damage as opposed to a flat nosed bullet. The flat nose not only wounds much more than a round nosed bullet, but it keeps the penetration straight and thus deeper. Notice the below velocities recorded from my personal 380 auto pistols. These are real-world guns, and thus the speeds are realistic and not exaggerated speeds produced from laboratory test barrels. What you see with Buffalo Bore Ammo, is truly what you get in the "real world," where it matters. You can expect 20+ inches of straight-line penetration in flesh and bone with this load. If you are worried about over penetration with this load, DON'T! You chose to carry a tiny under-powered 380 auto pistol, and the trade-off is that you are now going to have to stay alive with that pistol and over penetration will be the least of your worries if you end up needing this gun to save yourself or your family. I bought these for my Walther PPK while out hiking. There are no bears but there is the occasional eastern coyote or rabid raccoon. I chronographed 1,115 fps w/ the 100 gr. BB load out of the little PPK! A standard 9mm is ~1,100 fps w/ a 115 gr. bullet out of a 4" barrel. Only 15 gr. of lead separating this from a 9mm. Awesome. I have been carrying the 380 100 grain P hardcast load in my Colt Mustang for several months now. The great thing is I carry everywhere and don't feel outgunned at all. It was especially gratifying to read about the recent event where a guide shot a grizzly with 9mm 147 grain hardcast loads. If the hardcast load he used was that effective on a grizzly, imagine the terminal effectiveness the P 100 grain hardcast 380 load would have on humans and smaller 4 legged varmints. I bought a few boxes of the P hardcast several years ago. I bought them for a Colt 380 Govt, but was never able to carry the govt because it was a little too large for front pocket carry. Purchased a Colt 380 Mustang last weekend. I shot a box of practice ammo to break it in, then shot 5 rounds of the BB P 100 gr hardcast. I had a better group with the BB HC round than with the practice ammo. Recoil was slightly more stout, but nothing to be concerned about. I been a FNHC advocate for many years and now that I have the right pistol front pocket carry on a regular basis. 100 grain hardcast P rounds are the only rounds I trust for carry. BTW not so much concerned with 2 legged problems, more for smaller 4 legged problems. Although there is an increase in recoil in my Walther PK380, it was much less than expected. However, I discovered one issue. I have to be even more careful than usual about hand position or, with the added recoil, my finger(s) will trip the PK380's ambidextrous magazine release. That would not be good in a self-defense situation! More practice with this ammo is required. I am 250 pounds and from my PK380 I could not tell the recoil between this and practice ammo. I saw a video of it penetrating 31 inches of bare gel. It will obviously fracture bone and be able to penetrate the 48 inch chest of a large man.A JHP cannot compete with this in calibers .380 and below. Aim for the belly button or pelvis and this will crack any bone it hits - lumbar or pelvic. 3 shots in 3 seconds at 3 feet to 3 yards and an aggressor will come to a complete stop. It is not a training load. It is not a toy. It is a working tool for self defense from 5 feet to 15 yards. I no longer am authorized to shoot fleeing felons, so beyond 15 yards they can get away. Purchased as self defense ammo for my Sig Sauer P232. Noticeable increase in recoil, but still very manageable. Zero issues. Will continue buying. the 100 gr p is capable of stopping any attacker. the hard cast flat nose pierced 2 one eighth steel plates spaced 1 inch apart. this means it will break the sternum, blow through internal organs and break the spine. I use a keltec p3at and recommend a wolf recoil spring kit. I am using a 16 oz. recoil spring and have no problems. Sig P238, 2.75" barrel. At 72 F. 10 rds chronographed 1079 fps, SD = 8. Awesome! All 10 rds had dents near or on the case mouth after ejection. I think I need a heavier buffer spring. No failures of any kind though. All my carry magazines are loaded with these now. I acquired a Bulgarian Mak some years ago now. At the time, the available 9X18 ammo was either rare or corrosively primed. I bought a .380 conversion barrel but found that, with the stiffer Mak spring, available .380 ammo failed to reliably cycle the Mak's action. BB's *P loads more than simply correct this problem. Both the Makarov and my Beretta 84FS function beautifully with BB P ammo . and are a sheer joy to shoot. They truly DO convert the questionable "normal" .380 caliber into a serious self-defense weapon. Kudos to BB !! BTW . Hornady's Critical Defense boasts "reduced recoil." I vouch for that claim, since it lacks sufficient "oomph" to cycle the action on either the Mak or the Cheetah. I'LL BE BACK !!! Awesome round out of a Sig p238. Very accurate out to15yds. Penetrated 1/4 inch steel plate at 7yds. AWESOME! Ran a box of these through my Ruger LCP and immediately noticed that they had significantly more energy than anything else I'd ever shot out of that gun. Like another reviewer said, shooting these is plain uncomfortable but I imagine that getting a knife plunged into my belly by some perp probably hurts a hell of a lot more. Definitely a 5 star defense round. After testing various rounds in my KAHR P380, I now carry these and the barnes HP rounds when I have to carry a pocket sized pistol. They feed with no failures and give the little 380 some real defensive power. I load in 3 HP rounds followd by 4 of the 100gr solids and feel they will do the job if called upon. My favorite round to shoot and carry in my lcp. It is extremely powerful and just about turns my 380 into a 9. I feel very confident in the round and do even think about "would my lcp be enough fire power?" I suggest everyone carry buffalo bore. I will soon be buying some 380 JHP, more 308 blue tips, 9, and 7.62x39 I am amazed by the power of these loads. I love it! These are magnificent. I shot 5 rounds through my LCP yesterday. They are EXTREMELY powerful and flat-nose hardcasts punch through anything. I do not advocate using expanding bullets in lower energy handguns. These are perfect for the LCP. Completely unexpected penetration out of a .380!!! The extra zing in these rounds is definitely noticeable, and gives my LCP the extra power I want to be assured that it can stop an attacker, if need be. That being said, shooting these rounds is not comfortable at all, and the recoil is slightly painful in the Ruger LCP.... This, however is not a round to be shooting with on a daily basis, so if the need should arise comfort should be the last thing on your mind anyways. 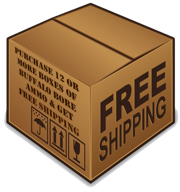 I recommend putting a box through your gun to make sure it works and feeds properly, then load up your gun and carry it. I trust these rounds with my life, and I know you will too, once you see the difference between this round and standard pressure 380 rounds, its a no brainer. This is the real deal, and this kind of firepower from a compact 380 has been long overdue. I had doubts about the .380 being able to do the job. After all, it was just a .380, right? So I bought a box to try through my buddy's Bersa Thunder CC. I was instantly convinced this was the real deal. I purchased a Diamond Back .380 made in Boca Raton, Fl and filled it these great rounds. It is my daily CC configuration. These rounds make every other round I've tried in .380 seem weak at best. Just shot it in a Walther PPK/S. The guy shooting next to me asked if I was shooting a .40 caliber. This is my new carry load mixed with Talon. I will try your H.P. next. Only, negative was a bit less accuracy. I just shot a few clips of your .380 100 FNHC round. I I shot each bullet into a block of solid pine wood that was about 8 inches thick. To my surprise your bullet penetrated almost 4 inches. Thats about an inch more then the 2 competing other bullets I performed the same test on. WOW. this ammo turned my SIG P-238 into a fire breathing dragon. I can trust this ammo with my life. Perfect .380 load to carry with my little SIG. 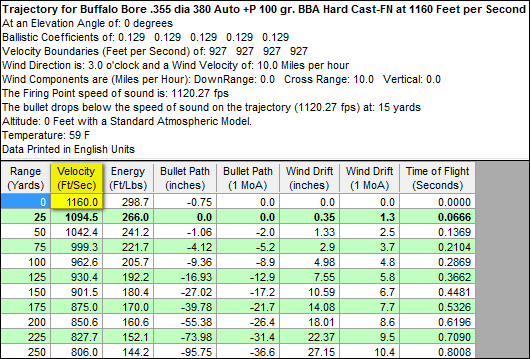 I've used Buffalo Bore ammo for quite a while now. .45 Colt, .45 ACP, .38 Special, and now .380. Always got results as advertised. Never a miss fire. I recommend BB to all my friends. I fired this load from my Bersa Thunder .380. This was easily the hottest load that I have ever fired from this weapon. Recoil is more than what I expected, with more kick than my full fram automatics. I would trust my life to this ammo. It is my ammo of choice when I concealed carry.